This is Part Two of the article , “Mystery Soldier’s Identity Expands a Family Tree”. Part One of this story can be found on MyHeritage.com. http://blog.myheritage.com/2012/05/mystery-soldier-his-identity-expands-a-family-tree/.I recommend reading Part One first. However, if you just can’t wait to know about the date and want to read this one first, I have not revealed the name of the soldier in this second article. I have referred to the first article in some cases so please be aware of that if you read them out of order as it may spoil some of the surprise. After overcoming my delight at finding a photograph from my childhood area of upstate New York, I focused on the photograph itself and how to narrow down the date. The image is attached to a card measuring 4 1/4″ x 6 1/2″. The picture itself is 5 1/2″ long and just under 4″ wide. The corners of the card are rounded. On the front of the card, in simple serif type, is the word “Tuck” followed by a comma, and in a similar simple sans serif type is the address “83 North Main St., Gloversville, N.Y.” It is this address that helps narrow down the photographer because for many years, it appears that North Main Street in Gloversville was somewhat of a photographer’s row. In particular 123 Main Street had been the place of business for many a photographer including the Scidmore Studio where another photo from Maggie’s album had been taken. But who was Tuck at 83 North Main? Gloversville city directories for 1889 showed only one Tuck in town, Arthur E., who was a physician with an office at 31 North Main and a home address of 25 N. Main. The 1890 directory shows Tuck’s Studio, Fred Girard, operator, at 21-23 N. Main. Likewise, the 1892 directory has Fred Girard at 21-23 N. Main. But by 1893, Arthur E. Tuck had suddenly become a photographer. His home address is listed as 11 High Street and studio at 21 N. Main. Still no match for Tuck at 83 N. Main. In 1894, A.E. has a studio still at 21 N. Main and is listed as both a photographer and a physician. Alas, in 1895, A.E. Tuck’s studio is finally located at 83 N. Main Street. Aha! The 1896 The Gloversville NY Daily Leader newspaper has a two-line advertisement for A.E. Tuck., photographer. This is the one and only advertising A.E. did apparently because I found no other mentions of him in the vast collection of Gloversville newspapers from the time period. In 1897, Tuck’s studio is still at 83 N. Main but now George H. Junod is listed as the studio manager. But in the 1898 Gloversville city directory A.E. Tuck is again the Photographer at 83 N. Main Street. Curiously, or perhaps not, Fred Girard, was gone from the 1898 directory completely, leaving only A.E. at Tuck studio. 1900 saw the studio at the same location with Junod as manager and Tuck is listed only as a physician residing at 3 Middle Street. Jumping ahead to 1901, we find that A.E., no longer a physician or a photographer, was now selling furniture and by 1904 he had moved to Rochester, NY. 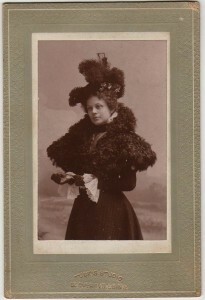 The photo had to be mounted sometime between 1895 and 1900. So, how to narrow this down to the date the photo was taken? 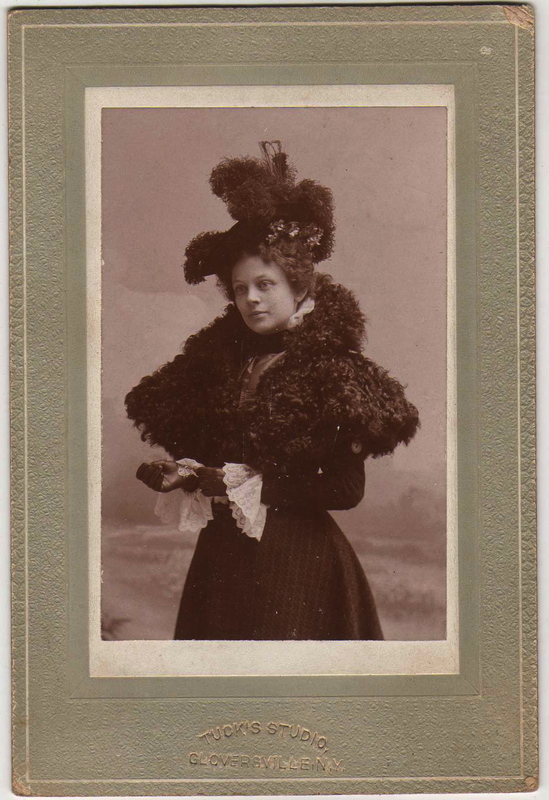 On the same page in Maggie’s album as our Mystery Soldier was a photograph of a beautiful young woman very fashionably dressed and wearing a richly plumed Gay 90s hat and magnificent fur mantelet. 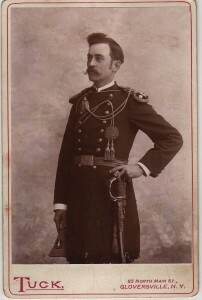 The blurred background and pose suggest the mid to latter half of the 1890s. The simple embossing “Tuck’s Studio, Gloversville, NY” on the frame’s light gray pebbled border places this card circa 1896-1897. I suspect that given the placement in Maggie’s album, this is a photo of Linda, Maggie’s niece and our Mystery Man’s wife. Notice that this card, unlike the one for our Mystery Soldier, has a cleaner, more modern look. I would place this photo as having been taken later than our Mystery photo, perhaps when George Junod took over as manager in 1897. Given this assumption that Junod updated the cardboard frame, it would place our Soldier’s photo between 1895-1897. We’re getting closer. An obituary from Friday, September 17, 1937 in The Leader Republican, states that our Mystery Soldier, died in Albany, NY. He had been a Pythian since 1887. The Gloversville City Lodge No. 320 was chartered on July 28, 1892 with him as a charter member. “At the time of his death, he held the position of Brigadier General of the Uniform Rank”, according to the obituary. Throughout the years, many articles appeared in the Gloversville papers and even The New York Times, about him. But one article in particular helps us pinpoint the date of his photo. The Gloversville NY Daily Leader from Monday, August 10, 1896 gives us our biggest clue as to the possible date of this photo. The article on that Monday morning, reveals that our Mystery Soldier attended The Grand Lodge, K. of P. at Canandaigua, NY. There “one of the important matters that came before that body for consideration, was the selection of a deputy grand chancellor. There was considerable strife over the matter, several places claiming they were entitled to the appointment.”, according to the article. At that meeting, our Mystery Soldier was appointed deputy grand chancellor of the thirty-first district, including Johnstown and Gloversville. This was a tremendous honor for the man described as “a great favorite among the membership, and [who] has a host of friends outside the order.” Though we were not there ourselves, it is my opinion that the photo of our Mystery Soldier was taken to honor that much-sought after honor by his fellow Pythians and why the photographer chose to have him pose in such a proud and confident stance. This places the date of the photo in mid-August, 1896 or shortly afterwards. My plan is to make my blog different than most that I’ve seen. Since I spend my time researching the photos of your families, I want to tell the details of dating and placing your families’ photographs and telling the stories within them. Occasionally I may put in a blog about my family but most of what I’ll do will be about sharing the skills and knowledge to help you and your family. I hope, too, to make some family connections for you. My new MatchMaker page on this website is a gallery of mystery photos, ones that I’ve worked on but for various reasons, haven’t been able to identify the Mystery Man or Mystery Woman in the photo. I hope that you’ll check out the first photos in the MatchMaker Gallery and come back often as I add more of my clients’ mystery photos. If you recognize anyone in the photos, please contact me and I’ll help make the match between you and the photo’s owner. In the coming months, I hope to bring you more stories about our family photos from Eastern Europe, Western Europe, America, Canada and where ever else we’ve wandered. And I’ll explore how to look at our family photos in entirely new ways that can help you overcome the brick walls in your genealogy searches and learn more about the lives of those who came before us. I love, love, love, love, love photos and I’d love to get your feedback on my new venture, so please feel free to leave a comment or send me an email. Now I know I said that I would mostly write blogs about your photos, but I’d be amiss if I didn’t dedicate my first blog to my origins, with a photo of my family. 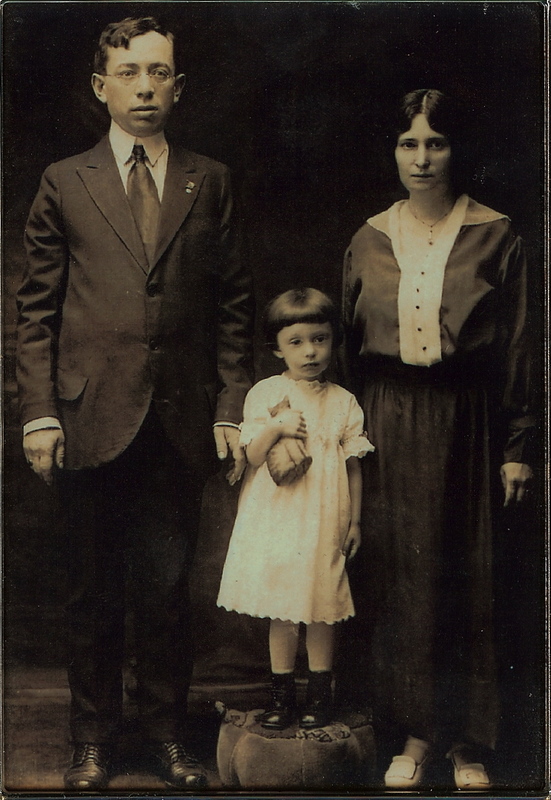 This is the only photograph I have of my Grandpa Abe (standing alongside my mother and grandmother). It was taken in 1918, just six months before Abe died of the Spanish flu at age 31. How do I know this date? Besides the clothing clues and my Mom’s age in the photo, my family passed down the information that my grandmother was pregnant with my aunt when the photo was taken. My aunt was born just two weeks before the day of Abe’s death. My Mom became the keeper of the family stories and now it’s my turn. I hope that all in the photo are looking down and wishing me well.